Snoopy Run Singapore is back in 2018!!! Registration will be activated here at 12 noon, Tuesday, 27th February 2018! Awesome news! 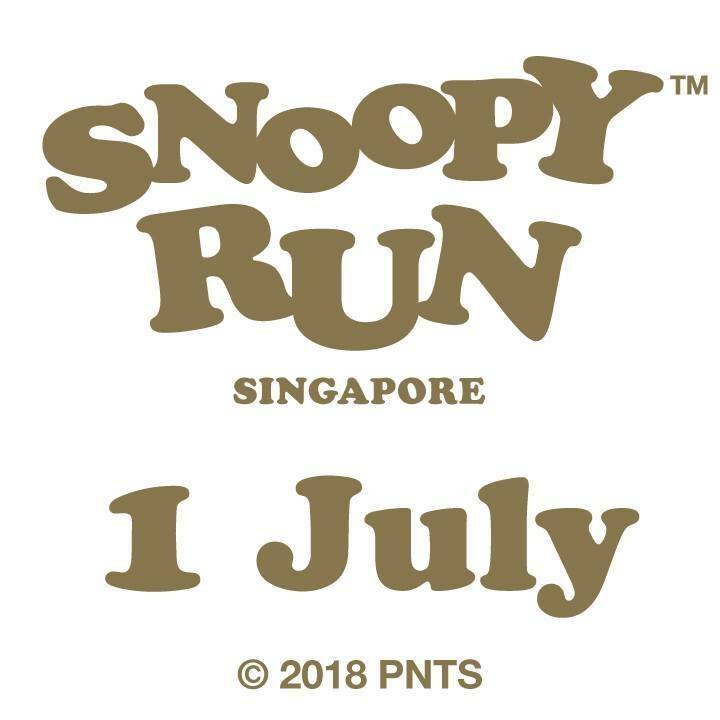 The Snoopy Run, a fun run staged in several international cities, is coming to Singapore again on Sunday 1 July, 2018. 2018 is also the Year of the Dog - Snoopy’s year! 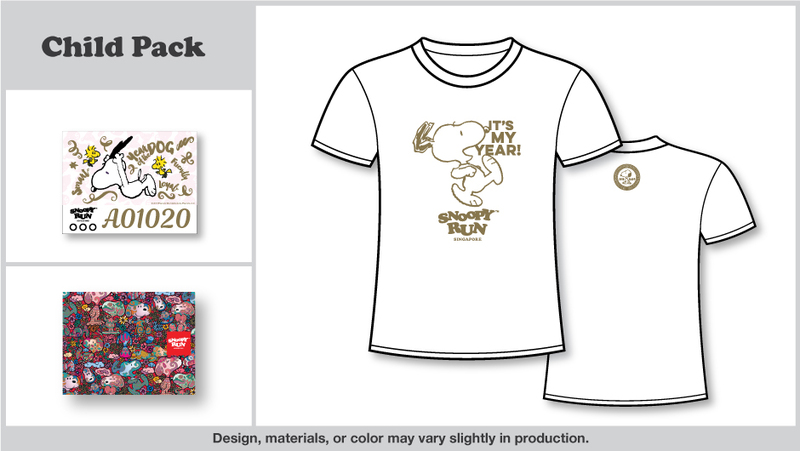 For the first time, special edition Year of the Dog Snoopy runner packs will be available in Singapore. Don’t miss out on the amazing and stylish designs; including a special gold-ink printed tshirt to add a little glam to your healthy lifestyle. 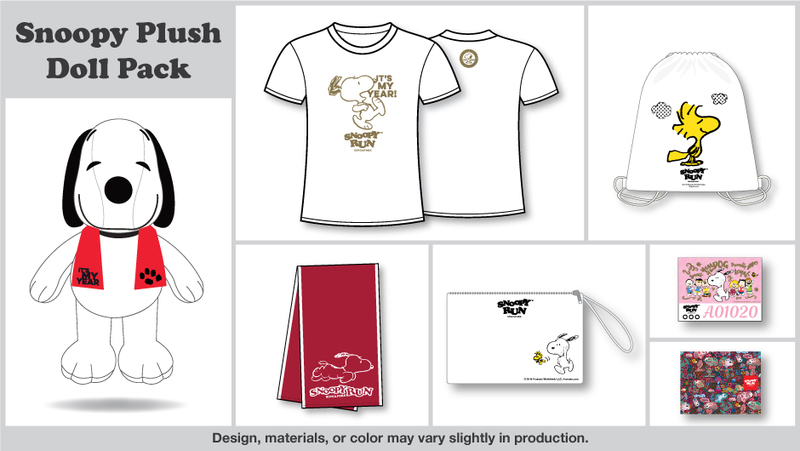 In addition, there’s a super cute, limited Snoopy Run doll available. The fun carnival run day will be held in the beautiful Bedok Reservoir Park, conveniently located on the MRT. Enjoy selfies at the new photo opportunities, including first ever shown in Singapore, the 6 meter tall Peanut’s character inflatable will be featured at the run. Sign up to our official snoopy run newsletter on our Snoopy Run official website. 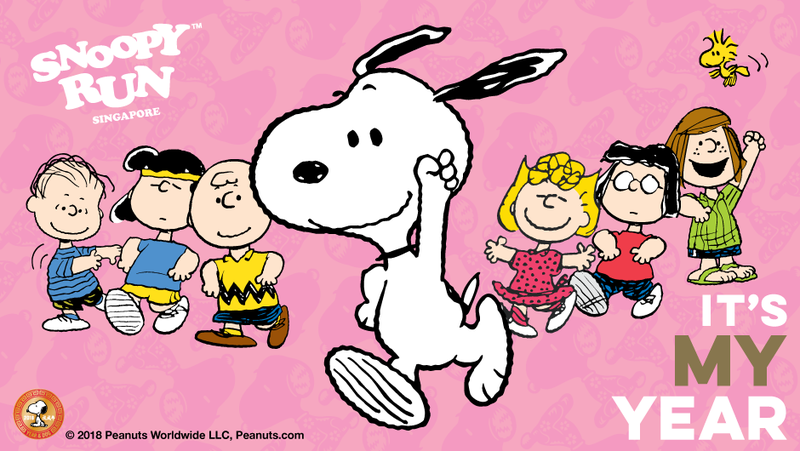 Like our Snoopy Run Facebook fanpage and text your whole gang to join the Snoopy Run! - Children’s t-shirt sizes are only available in the Child Pack option. Children under the age of 12 should be accompanied by an adult. Participants under 18 years of age must have their parent or legal guardian sign a permissions form. 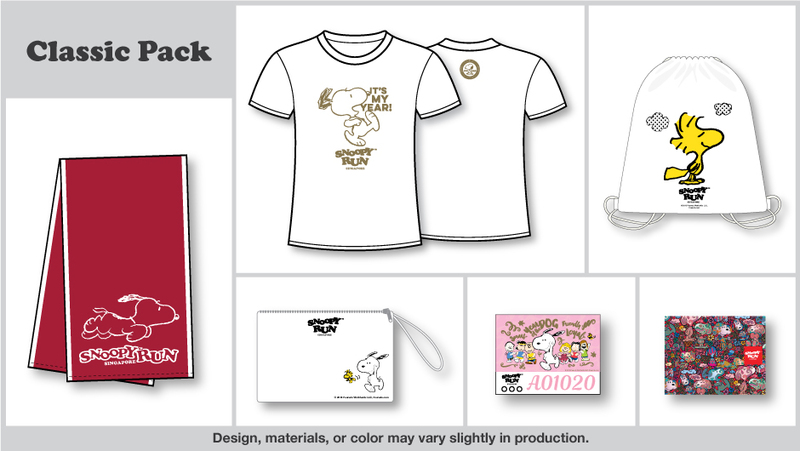 Each registered runner will also receive a medal and finish line gifts on completion of the Snoopy fun run in Singapore 2018! Participants under 18 years of age must have their parent or legal guardian sign a permissions form. This is a fun run for friends and families, approximately 4 to 5km depending on final route approvals. It is not a high intensity sports marathon. The Snoopy fun run is open to anyone over 5 years old. Children under the age of 12 should be accompanied by an adult. Participants under 18 years of age must have their parent or legal guardian sign a permissions form. Participants should be healthy, and not suffer from any previous injuries, or heart conditions. All runners should remember to stay hydrated. We suggest you could bring a water bottle, or there will be water stops. If anyone does not feel well on the day of the race, you should not partake in the race. Safety is very important, so please remember to respect other runners. No pushing or shoving allowed. More race information and details will follow shortly. From the date of purchase up until the 7th day, you will be given 90% refund of your total registration fee. E.g. the registration fee is SGD$49, you will receive a refund of SGD$44; please note that the processing fee from the ticketing page (Active) is non-refundable. 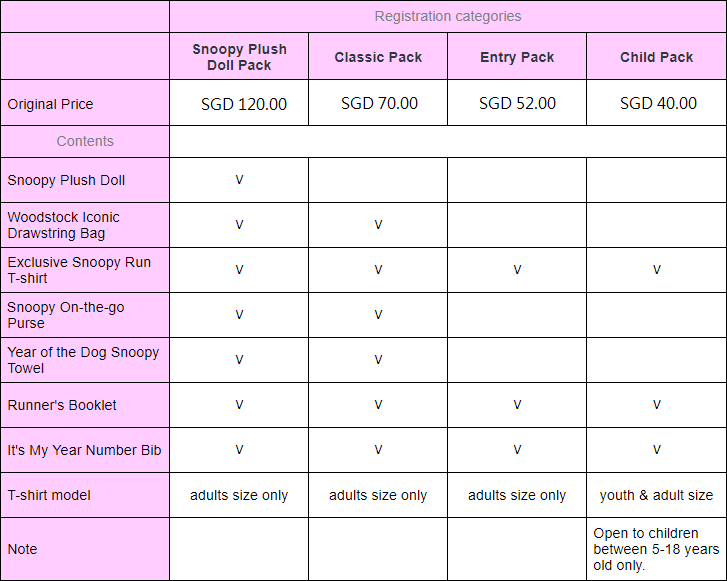 Click here to book or register for Snoopy Run Singapore 2018!